Done as part of the planning/worldbuilding for my (very much not complete) fantasy novel Aviarium, and because I like drawing. Atana is a world inhabited by winged beings and dragons- and entirely cut off from other universes for years. In a more familiar world, Winter is a time-traveller, perpetual wanderer, and good friends with Shakespeare. And has no idea parallel universes are even real- untill a pathway across the void opens - just slightly unexpectedly - in her best friend's back garden. 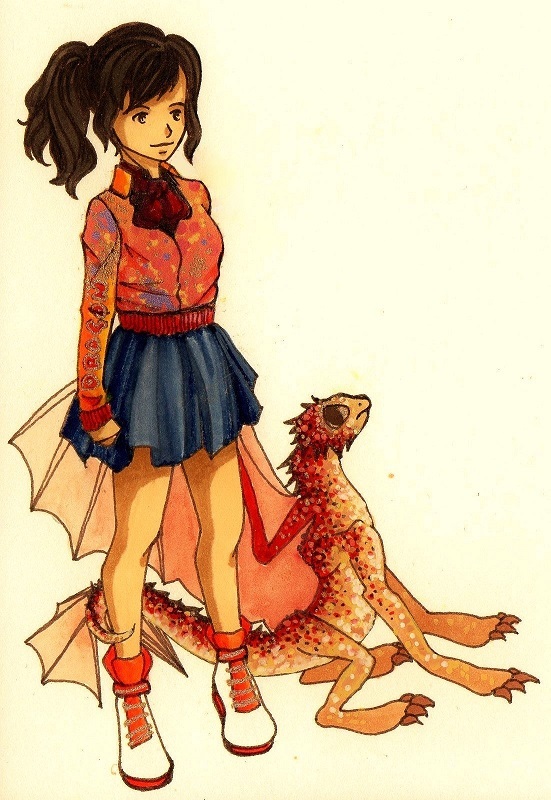 The pic is of a small fireheart dragon called Mishka, and Aliya, an Adhar* fire mage. A couple of thoughts on the dragon - I like the design, especially the little back-wing things on the tail which are very cool (and I guess in flight would remind one of the tail-wing things on very early aircraft). I think my only quibble is that I'd like to see a bit more muscle buildup at the base of the main wings, and maybe have them connect to the body a little lower - I think you want the wings to look a bit more powerful, if that makes sense, and having the base of them look stronger I think would help with that. I also really like the idea of someone who is used to time travel already finding that sort of normal but then being baffled by the idea of parallel universes, given I think we sit both things in the same sort of category of "total sci-fi". I am so glad people are interested in this! and like the art! yay! The world Winter comes from is physically nearly identical to ours, but has a different timeline and certain different properties, such as time travel being possible So she is frieds the Shakespeare that exists in *that* universe, not our Shakespeare. I LOVE THIS TOO- the reason its a thing is because it kinda happened to me: I was writing time-travel fiction from the actual literal begining, but did not discover Narnia untill I was a bit older, and was absolutely captivated/blown away by the whole idea of a lost magical world. I can take no credit for the dragon's tail-wings - that comes from the how to train your dragon movies. I love all the art used there, but especially the dragon designs. There are a *lot* of dragon skeleton designs on the internet, and they all do place the wings lower on the body- but they also have the legs and wings attaching from a single set of shoulder blades. But (whilst not being brilliant at zoology), I feel you'd need two sets of shoulder blades, so the forelegs and wings could move fully independntly, and because the horse-type or dinosaur-type shoulder blades used for the forelegs are so different in shape and position to bird or bat shoulder blades that are used in flight. I actually agree with you about the double-shoulder thing, I think that's completely fine, I just think the forelimb shoulders might want to come before the wing shoulders unless you're happy with Mishka having a very odd flying posture - as it is, the weight of her (his? their? unsure) body is almost all behind the wings with no additional support, so even assuming the wings are stronger than they look then the body would dangle vertically downwards after the shoulders (which does happen with some animals, like longhorn beetles IIRC) rather than allowing for a more conventional horizontal flight posture like we're used to birds or bats having. You could also solve the problem by having bigger gliding membranes or something lower down, which would allow the front wings to provide propulsion, and the fairly large legs could also then have a function in providing additional springy lift. The final option (other than the "well it works because I say so") is a flight bladder that somehow collects helium/hydrogen or something, which requires no external changes to the animal, I guess. A natural hydrogen collecting system would also work well alongside fire breath I guess, though it might also lead to the risk that if you ever hit this sort of dragon hard with a sword it would literally blow up in your face. I NOW ALSO WANT TO READ ARDAN SHAKESPEARE -it literally only just occurred to me how different that might be! Ah. Didn't think about flying posture at all, actually. Hmm... The exploding dragon idea is truly beautiful, it sounds like something you might find in a discworld novel but I don't think I want to go quite that whacky (things get a little serious later on in the novel and I don't think the risk of your dragon blowing up quite fits) - how about dragons having hollow bones like birds? Hm, well, that decreases the weight, but not the relative balance along the body which I think is the issue? The question is basically how the back part of the body gets enough lift to go horizontal rather than just flopping down behind the wings. You know so many obscure Tolkien characters I'm lost  but I'm sure it would be brilliant bc how could Tolkien and Shakespeare as a writing colab not work? Also, what about elves ending up in the regular Shakespeare plays, say, or Macbeth with hobbits ? now have to experiment with giving dragons more bird-like tails I think, that's fun  I love figuring this kind of thing out. I'll definitely end up keeping a range of dragon designs, anything I like the aesthetic of. Aldarion and Erendis is great, it's a whole tragic story in Unfinished Tales of a Numenorean prince who frequently abandons his wife to go sailing off to defend Middle-earth but ultimately causes evil due to his estrangement from his own family.